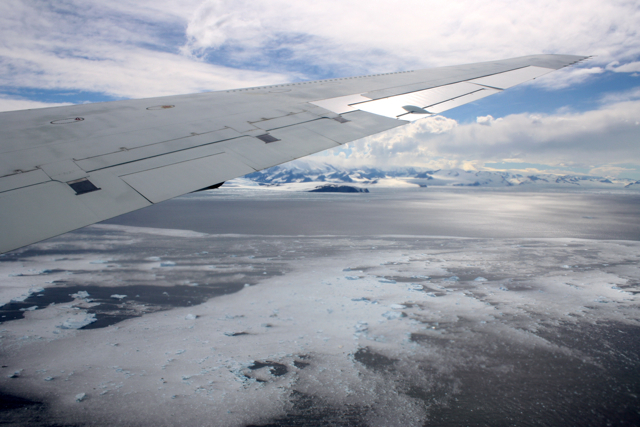 PUNTA ARENAS, CHILE – The first flight of Operation Ice Bridge was made from the southern tip of South America on Friday, Oct. 16. 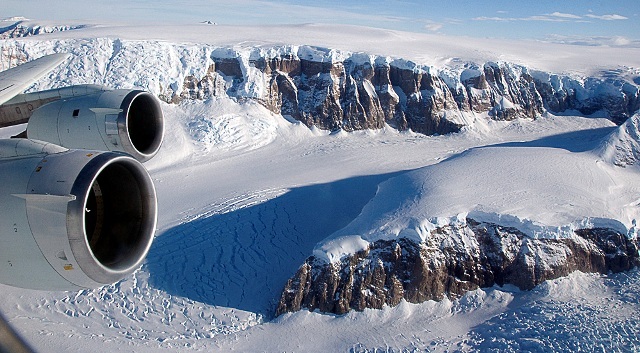 The primary target was the Getz Ice Shelf along Antarctica’s Amundsen Coast. 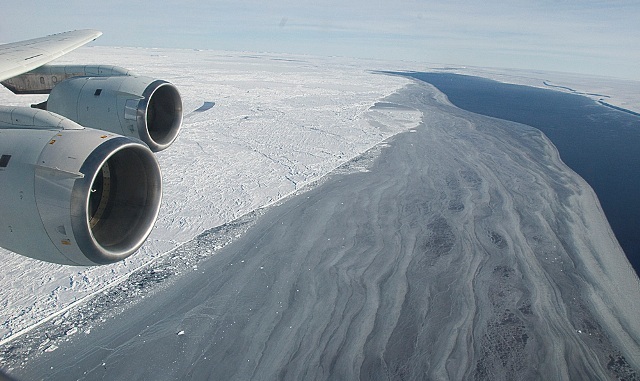 The DC-8 flew two parallel tracks along the coast, one just offshore over the floating ice shelf, and one just inland. 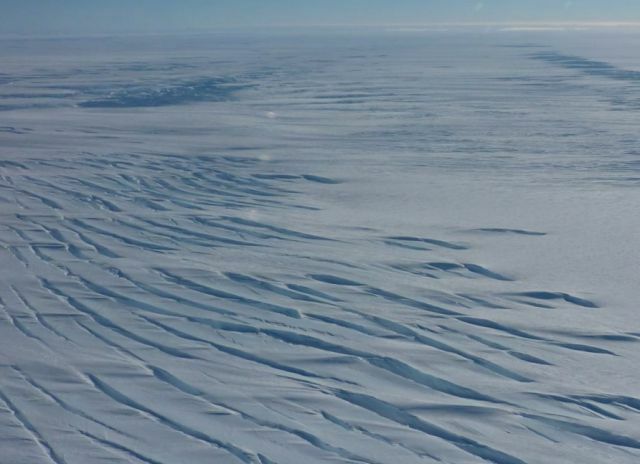 By measuring on either side of the “grounding line” between the floating ice and the ice on land, scientists can determine the rate at which this near-shore part of the ice shelf is melting. 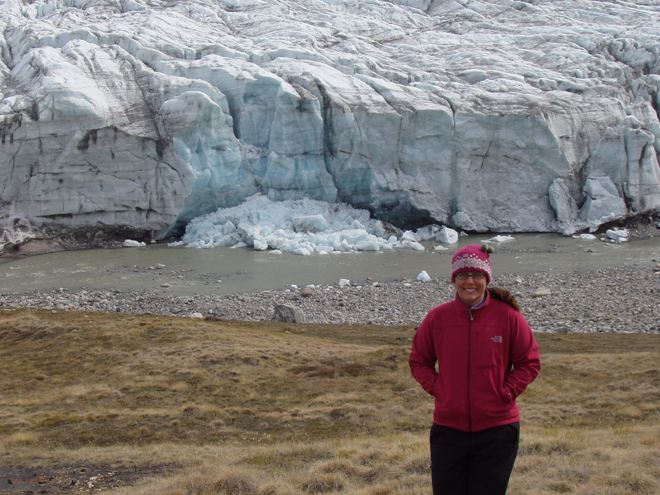 This target area was selected from the series of flights planned because weather forecasts showed that this was the only clear area available. 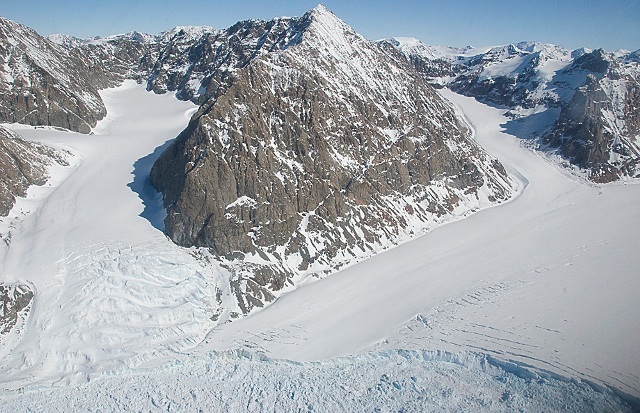 The low-altitude Getz grounding line paths would allow for a survey of the bottom topography with the MCoRDS instrument, a search for the presence of under-ice water with the gravimeter, and ice surface topography measurements with the ATM laser instrument. The plane took off at 9:11 a.m. local time with 31 people onboard, including a videographer with the Associated Press. The DC-8 flew at 35,000 feet on the ocean transit to Getz. 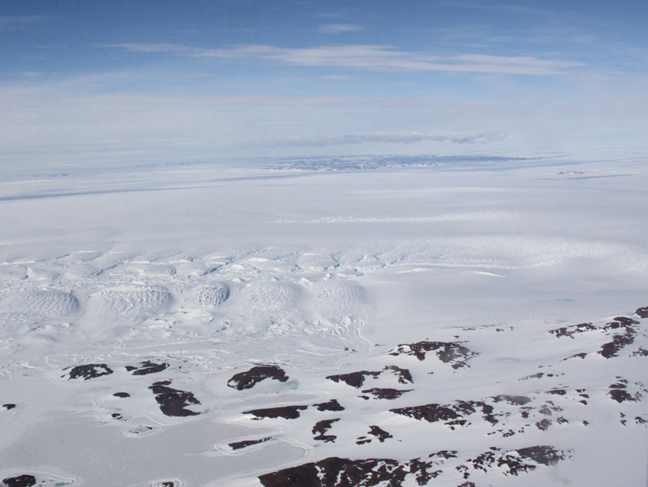 During this part of the flight, the LVIS laser and the DMS mapping camera made observations of the sea ice. 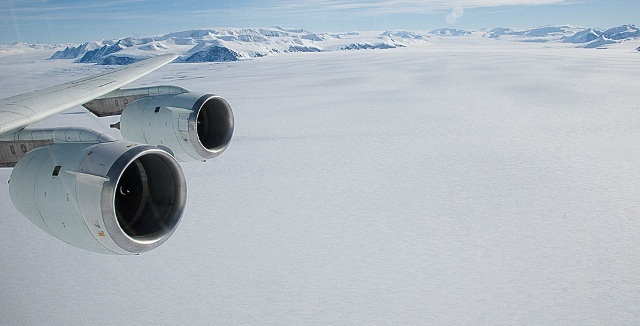 The DC-8 covered 1630 nautical miles before getting to its science targets in Antarctica. The DC-8 descended to about 1500 feet just east of the Scott Peninsula to begin the low-altitude observations. 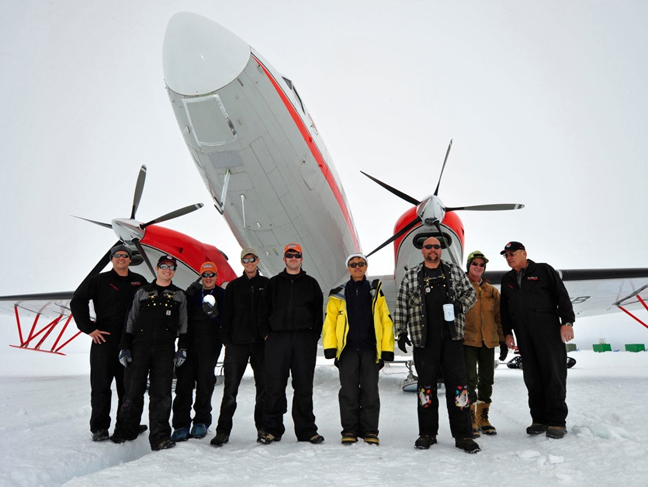 At the end of the flight path over the Getz Ice Shelf, the plane turned out over the sea ice, which was characterized by open water. 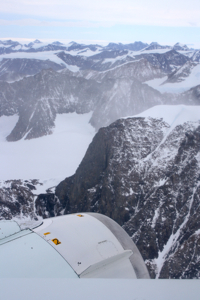 The DC-8 then flew up the DeVicq Glacier to an elevation of about 5,000 feet. Returning to the onshore survey line, the pilots were able to fly the entire line with clear skies. We completed a total of 3.5 hours of low-level flight. 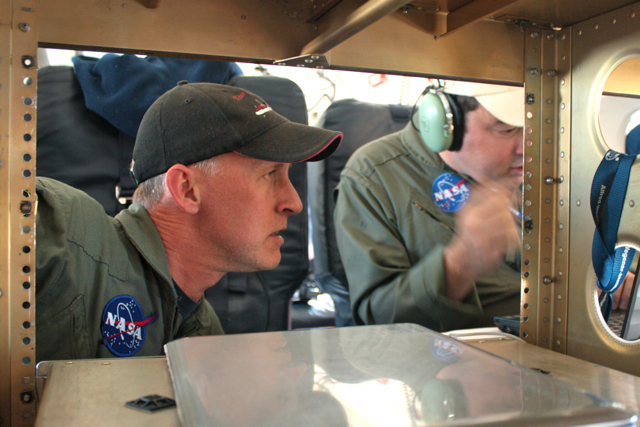 The ATM team reported collecting about 200 million laser measurements during the flight. The DC-8 landed at about 9 pm. Total flight time: 11 hours, 45 minutes.